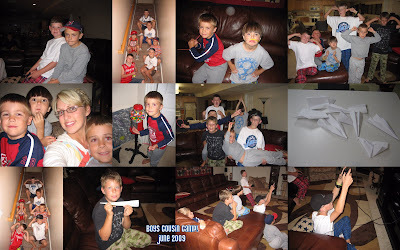 Question: What do you get when you take 6 energetic boys, add a paper airplane contest, minus parents, and multiply the number of sodas drunk during the night by 10!? You are such a cool Aunt. It was great to see you at Lindsay's reception. Sounds like such fun. How do you make those cute picture collages? I have been looking to be able to do that for ages.